It is often reported that the name of the Cairn Terrier is derived from the piles of stones common throughout Scotland that serve as landmarks or memorials. While it is true that these dogs often helped bolt otter, fox, and other vermin from them, the name ‘cairn’ was not the original choice for the breed. Aside from the Cairn, there are four other terrier breeds that hail from Scotland, the Dandie Dinmont, Scottish, Skye, and West Highland White Terriers. While the history of these breeds can be murky it is normally accepted that they are all closely related, with the Cairn being the oldest, known since at least 1500. Until 1873 all Scotland Terriers were grouped together as Scotch Terriers, but were then separated into two groups, as Dandie Dinmont and Skye Terriers. The breeds we know today as the Scottish, West Highland White and Cairn all fell under the Skye Terrier grouping along with the breed of that name. It was not until 1909 that the Kennel Club (KC) offered classes for Short-haired Skyes. The Skye Terrier Club was unhappy with this addition and eventually a change of name to Cairn Terrier of Skye was suggested, and the shortened name of Cairn Terrier was agreed upon in 1912. 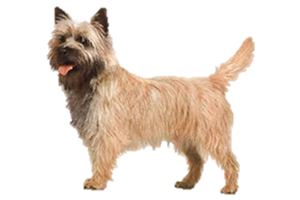 Is the Cairn Terrier Right for You?